↑ "Workforce Profile". NASA. जनवरी 11, 2011. पहुँचतिथी दिसंबर 17, 2012. ↑ Dreier, Casey (दिसंबर 18, 2015). 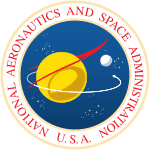 "[Updated] An Extraordinary Budget for NASA in 2016 - Congressional omnibus increases the space agency's budget by $1.3 billion". The Planetary Society. पहुँचतिथी February 4, 2016. ↑ "Official US Executive Branch Web Sites - Newspaper and Current Periodical Reading Room (Serial and Government Publications Division, Library of Congress)". loc.gov. पहुँचतिथी मई 24, 2016. ↑ "Frequently Asked Questions". hq.nasa.gov. पहुँचतिथी मई 24, 2016. ↑ Netting, Ruth (जून 30, 2009). "Earth—NASA Science". ओरिजनल से जुलाई 16, 2009 के पुरालेखित. पहुँचतिथी जुलाई 15, 2009. ↑ Netting, Ruth (जनवरी 8, 2009). "Heliophysics—NASA Science". ओरिजनल से जुलाई 16, 2009 के पुरालेखित. पहुँचतिथी जुलाई 15, 2009. ↑ Roston, Michael (अगस्त 28, 2015). "NASA's Next Horizon in Space". New York Times. पहुँचतिथी अगस्त 28, 2015. ↑ Netting, Ruth (जुलाई 13, 2009). "Astrophysics—NASA Science". ओरिजनल से जुलाई 16, 2009 के पुरालेखित. पहुँचतिथी जुलाई 15, 2009.